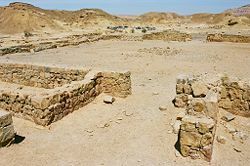 Remains of the probable Essene community at Qumran. The Essenes (sg. Essene, IPA: [ɛˈsin]) were a Judaic religious group that flourished from the second century B.C.E. to the first century C.E. They have gained fame in modern times due to the discovery of the extensive religious library of religious literature discovered at Qumran and known as the Dead Sea Scrolls. The Qumran community is widely believed to have been a major Essene compound, where the group lived an ascetic life and trained priests to purify the Temple of Jerusalem in preparation for the coming of the Messianic kingdom. The community preserved multiple copies of many of the the Old Testament books, untouched until their discovery in 1946. It also produced its own unique religious literature, found nowhere else. In recent years, some scholars have questioned whether the Qumran community was indeed an Essene group, and have challenged the idea that the Dead Sea Scrolls were even produced by this community. Whether or not they lived at Qumran, the Essenes also lived elsewhere in ancient Israel. Their tradition was characterized by asceticism, strict adherence to the Jewish law, a special concern for the purity of the priesthood, and a belief in the imminent coming of the Messiah or Messiahs, who would usher in the Day of the Lord in which Gentile rule would be vanquished through a cataclysmic conflict between the Sons of Light and the Sons of Darkness. 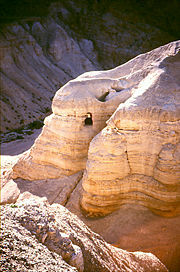 Caves at Qumran in the area where the Dead Sea Scrolls were discovered. Until the discovery of the Dead Sea Scrolls, the main sources of information about the life and belief of Essenes was the detailed account contained in the work of the first century Jewish historiographer Flavius Josephus entitled The Jewish War, written about 73-75 C.E. (War 2.119-161), and a shorter description in his Antiquities of the Jews finished some 20 years later (Ant. 18.11; 18-22). Claiming first-hand knowledge (Life §§10-11), Joseph refers to the Essenes by the Greek name Essenoi and lists them as the followers of one of the three sects in "Jewish Philosophy'" (War 2.119) alongside the Pharisees and the Sadducees. Other contemporary accounts of the Essenes were provided by the fist century C.E. Jewish philosopher Philo (Quod Omnis Probus Liber Sit XII.75-87, and the excerpt from his Hypothetica 11.1-18 preserved by Eusebius, Praep. Evang. Bk VIII). The Essenes are also mentioned briefly by the Roman equestrian Pliny the Elder (Natural History, Bk 5.73). Pliny, also a geographer and explorer, located them in the desert near the northwestern shore of the Dead Sea, where the Dead Sea Scrolls were discovered in 1947. The Essenes are not much mentioned in ancient rabbinical sources and not at all in the New Testament. However, the description of the ascetic practices of John the Baptist have led some to speculate that he may have been associated with the group in some way. Josephus uses the name Essenes (Essenoi) in his two main accounts (War 2.119, 158, 160; Ant. 13.171-2) as well as in some other contexts. Philo's usage is Essaioi. Pliny's Latin text has Esseni. At least during their later history, the Essenes seem to have had a wide following. According to Josephus, the Essenes had settled "not in one city" but "in large numbers in every town." (War 2.124) Josephus' reference to a "gate of the Essenes" in the Temple Mount suggests an Essene community living in this quarter of the city or regularly gathering at this part of the Temple precincts. (However, the Dead Sea Scrolls indicate that the group, at least at some point, avoided Jerusalem and its Temple as corrupt.) Philo speaks of "more than 4,000" Essaioi living in "Palestinian Syria" (Quod Omn. Prob. XII.75), more precisely, "in many cities of Judaea and in many villages and grouped in great societies of many members" (Hyp. 11.1). Pliny locates them "on the west side of the Dead Sea, away from the coast ... [above] the town of Engeda." Many modern scholars and archaeologists associate this reference with settlement at Qumran, a plateau in the Judean Desert along the Dead Sea. This view, though not yet conclusively proven, has come to dominate the scholarly discussion and public perception of the Essenes. 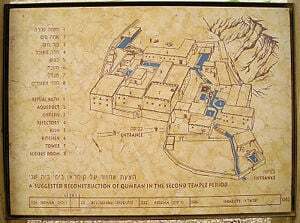 Reconstruction of the Qumran compound, thought to house the Essene community. Presuming that it is correct to identify the community at Qumran with the Essenes and that the community at Qumran are the authors of the Dead Sea Scrolls, the Essenes' community school was called "Yahad" (meaning "oneness of God") in order to differentiate themselves from the those among the Jews who are repeatedly labeled "The Breakers of the Covenant." This view is expressed especially in the unique prophetic scroll entitled "Milhama" (meaning "The War") in which the master of the Essenes, referred to as "The Teacher of Righteousness," prophesied that the Jewish so-called "Breakers of the Covenant" Jews will be on the side of the Son of Darkness in the great battle on the Day of the Lord. The accounts by Josephus and Philo report that the Essenes led a strictly celibate, communal life—often compared by scholars to later Christian monasticism. However, Josephus speaks also of another "rank of Essenes" that did get married (War 2.160-161). According to Josephus, the Essenes practiced collective ownership (War 2.122; Ant. 18.20), elected a leader whose orders they obeyed (War 2.123, 134), were forbidden from swearing oaths (War 2.135) and sacrificing animals (Philo, §75), controlled their temper, served as channels of peace (War 2.135), carried weapons only as protection against robbers (War 2.125), had no slaves but served each other (Ant. 18.21) and did not engage in trading (War 2.127). Both Josephus and Philo have lengthy accounts of their communal meetings, meals, and religious celebrations. After a total of three years of probation (War 2.137-138), newly joining members would take an oath that included the commitment to practice piety towards Yahweh and righteousness towards humanity, to maintain a pure lifestyle, to abstain from criminal and immoral activities, to transmit their rules uncorrupted, and to preserve the books of the Essenes (War 2.139-142). Their theology included belief in the immortality of the soul (War 2.153-158, Ant. 18.18), but not necessarily the resurrection of the body. Part of their activities included purification by frequent bathing rituals. The presence of a large system of rainwater catchment and storage and Qumran supports the theory that the community was Essene. (However recent scholarly speculation suggests that it may actually have been a community of potters with no particular religious character. A manual of discipline and other documents among the Dead Sea Scrolls include a commitment to the strictest adherence to the letter of the Jewish law. Their strictness far exceeded that of the Pharisees and specifically opposed to the supposedly lax and corrupt priesthood of the Sadducees, who controlled the Temple in collaboration with the Gentile administration of the Roman Empire. While the Essenes resembled the Pharisees in their emphasis on incorporating the Jewish law into one's daily life, they differed in that the Essenes were more strict and emphasized the priesthood, as opposed to popular piety, more than the Pharisees did. The tradition of the Qumran community seems to have been especially harsh, forbidding priests even to move their bowels on the Sabbath, as well as requiring a separation of the sexes that the Pharisees would have considered unnatural. Another idiosyncrasy of the Essenes was that their literature seems to support a belief in two Messiahs: one to cleanse the Temple and its priesthood, the other to lead the war against the Sons of Darkness and re-establish the Davidic throne. Based on varying biblical accounts of the Messiah's nature and role, this view his accords with later Jewish traditions regarding a "Messiah ben-Aaron" (priestly Messiah) and a Messiah ben-David (Davidic or kingly Messiah). A portion of a Dead Sea Scroll, from the Book of Isaiah. A great deal of discussion has arisen concerning the Essenes and their beliefs, especially since the discovery of the Dead Sea Scrolls. John the Baptist is widely regarded to be a prime example of an Essene who had left the communal life (see Ant. 18.116-119), and it is thought they aspired to emulate their own founding Teacher of Righteousness who was reportedly crucified. One theory on the formation of the Essenes suggested the movement was founded by an earlier Jewish high priest, dubbed by the Essenes, the Teacher of Righteousness. The Teacher's office had been usurped, perhaps by Jonathan Maccabaeus (of priestly but not Zadokite lineage), who may be the person labeled in Essene literature as the "man of lies" or "false priest." This would also account for the bitter antagonism of some of the Dead Sea literature toward the Sadduceean priesthood, which controlled the Temple from Maccabeean times until its destruction in 70 C.E. Since the nineteenth century, attempts have been made to connect early Christianity and Pythagoreanism with the Essenes. It was suggested that John the Baptist and Jesus of Nazareth were Essenes. According to Martin A. Larson, the Essenes were Jewish Pythagoreans who lived as monks. As vegetarian celibates in self-reliant communities who shunned marriage and family, they preached a coming war with the Sons of Darkness. As the Sons of Light, this reflected a separate influence from Zoroastrianism via their parent ideology of Pythagoreanism. According to Larson, both the Essenes and Pythagoreans resembled thiasoi, or cult units of the Orphic mysteries. However, J.B. Lightfoot's essay argues that attempts to find the roots of Essenism in Pythagoreanism and the roots of Christianity in Essenism are flawed. Another issue is the relationship between the Essaioi and Philo's Therapeutae and Therapeutrides (see De Vita Contemplativa). It may be argued that he regarded the Therapeutae as a contemplative branch of the Essaioi who, he said, pursued an active life (Vita Cont. I.1). Contemporary authors such as Robert Eisenman present differing views affirming that the late Essenes were actually early Christians. Eisenman considers the Dead Sea Scrolls to be "Sadducean" documents of Messianically-inspired opposition to Roman-Herodian rule in Palestine. He identifies James the Just—the brother of Jesus described in the Book of Acts as the leader of the Jerusalem church—as the "Righteous One" who led this opposition movement until his death at the behest of the High Priest Ananus (with "wicked priest") in 62 C.E. The Essenes disappear from the historical record after the first century C.E. They left virtually no trace other than the above-mentioned sources until the discovery of the Dead Sea Scrolls. Some speculate that their tradition may have contributed to Christian monasticism, and some Jewish mystical thought associates them with various hidden kabbalistic or hasidic trends. Currently, there are several modern Essene Groups around the world. However, scholars of new religions, such as J. Gordon Melton in his Encyclopedia of American Religions, state that the modern American Essene movement possesses no authentic historical ties to the ancient Essenes. Melton states, "Essene material is directly derivative of two occult bestsellers—The Aquarian Gospel of Jesus the Christ, by Levi H. Dowling; and The Mystical Life of Jesus, by Rosicrucian author H. Spencer Lewis." However, other scholars, such as Gideon Ousely and Edmund Bordeaux Szekely assert that the Essene teachings had been hidden and assimilated into many mystical spiritual traditions around the world. In 1928, Edmond Bordeaux Szekely published his translation of The Essene Gospel of Peace, an ancient manuscript allegedly discovered in the archives of the Vatican and in old Slavonic in the Royal Library of the Habsburgs. Critics allege that the book is certainly not an Essene document. 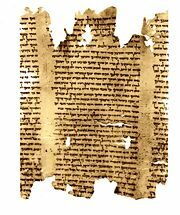 ↑ In this view the Dead Sea Scrolls may not have been the property of the Qumran community at all, but could have been deposited in nearby caves when scribes from Jerusalem fled from the Roman destruction of the Temple in Jerusalem in 70 C.E. ↑ On Some Points Connected with the Essenes Retrieved April 12, 2008. Burns, Joshua Ezra. "Essene Sectarianism and Social Differentiation in Judaea After 70 C.E." Harvard Theological Review 99 (2006) 247–74. This page was last modified on 15 August 2017, at 15:36.